If you would like to book one of these layouts for your show, please contact the secretary by clicking here. A fictitious British country branch line terminus station. Beaulieu-les-mines is envisaged as being located in the old heavy industry part of Belgium, between Charleroi and the French border. Freelance 1930's to 1970's somewhere in England. An example of this classic shunting layout. This represents an industrial quarter of a small central European town. It has a suburban main line with car parking, bus connections and a monorail to the shopping centre together with an old narrow gauge terminus forming a transport interchange. 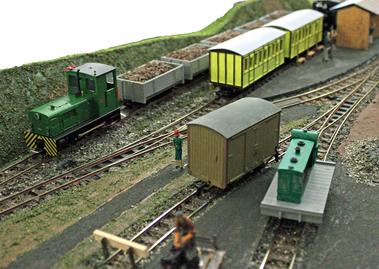 This layout has recently been acquired by a club member so that he can run his collection of Southern Railway models. It it is set in Sussex during pre-war Southern Railway days and is loosely based on Hellingly (junction) station on the Cuckoo line that was built originally by the LB&SCR. 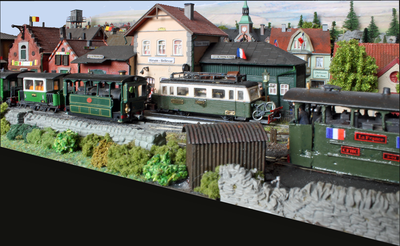 The model, which is set in the 1930's, portrays the terminus of a small branch line from Hirson in Northern France. This model bus diorama is based on the London Transport scene in the period 1975-1985. High in Sierra Nevada of California, the Malpaso 3 foot gauge railway still serves the local mines and communities. An English narrow gauge layout. A country terminus in southern Dorset. 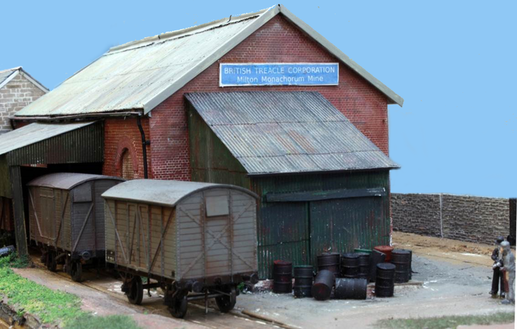 The model depicts the engine shed and wagon works at Moorswater which lies in the valley of the East Looe River below Liskeard. 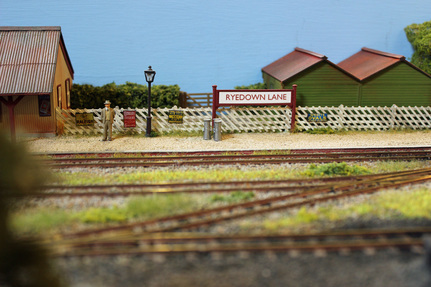 A fine scale Western Region layout set somewhere in South Devon in the mid to late 1950s. It serves a treacle mine, whilst up the line are china clay dries which provide the staple traffic. An English tramway set somewhere between the 1950's to 1960's. English steam & modern Image. A BR Southern Region single-track through station in north Cornwall with a branch into clay dries. A small layout depicting a rural narrow gauge light railway terminus in the 1930s. Inspiration comes from the light and narrow gauge railways associated with Lieutenant Colonel Holman F. Stephens. Tri-ang OO / HO layout with original buildings, British and Continental trains running on Series 3 & 4 track dating from the 1960's. Tri-ang TT (3mm) layout with original buildings and trains dating from the 1960's. Cornish tin mine on two levels. A layout for children (off all ages) to operate that features a well know blue tank engine and his friends. 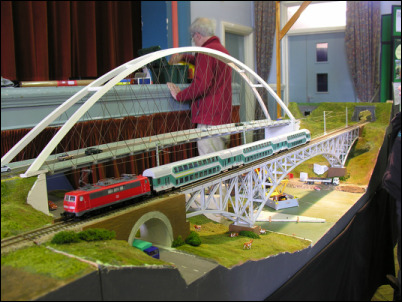 One of our members decided to 'retire' his first Zweibrucken layout, but couldn't come to terms with scrapping his two model bridges. A second member, whose job required frequent visits to Munich, joined the project and they decided to model the suburban 'S-Bahn' of the famous Bavarian (never German) city. An imaginary narrow gauge line was added to provide extra interest (and to use the second bridge).